And Mireille takes the time to answer your questions. After the lecture you will go home with new energy. You know how to do the MIR-Method and have had answers to your personal questions. And above all, you will feel you have a wonderful tool that makes you independent and helps you with health and emotional issues. 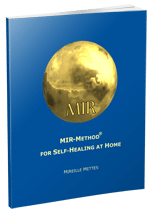 You can take home MIR-Method cards and you can buy the MIR-Method handbook. Lecture has been cancelled due to the opening of a MIR-Method center in the Netherlands. People who already paid will have their money refunded before September 1st. With apologies from Mireille Mettes.